After tentatively launching in the US in May, Google One, aka Google’s new unified storage plans and service, has been shyly expanding. It didn’t become available to “everyone” in the US until August, and even then, there were plenty of exceptions that meant not all users were able to migrate to the new plans. After that, it was announced for Argentina, Australia, Brazil, and Mexico as well as India. Now, users in two more countries are getting emails notifying them of an upgrade to Google One. 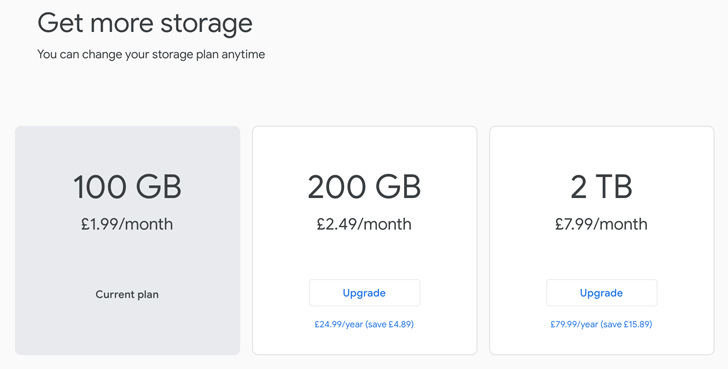 The 1TB plan, which previously cost £9.99 monthly, has been replaced by the new 2TB one, so you’ll be getting double the storage at the same price. There are also more choices, family sharing, online support, and various other perks to being a Google One subscriber. We don’t have any pricing details for Canada, but they should be inline with what we’ve seen in the US. The rollout of Google One has been hitting more and more countries over the past few weeks. We’ve had reports from users in New Zealand, Taiwan, Singapore, Czech Republic, Chile, and more who have received their upgrade emails. If you want to check whether the new storage plans are available in your country, head over to one.google.com. Thanks, Matej, Maximiliano, Liviu, Petr, Fabian. We’re getting word that Poland, the Netherlands, the UAE, Lebanon, and now Belgium are joining Google’s growing list of One-supporting countries. There’s probably some more in there, too, and we’ll update this list as we learn of them. Thanks, Piotr, Vincent, Abdullah, Faysal.